Now that you have made your Sourdough starter, also known as natural wheat leaven ( levain in France). You should have a quantity of around 600g. Avoid using water treated with chlorine, it is better to use bottled still spring water and it is best to use organic flour. Always warm the water to about 32⁰C before mixing. Get into the habit of smelling the natural leaven. With a new leaven stir at least once a day. Store the leaven in the fridge. You must refresh the leaven at least once a week but preferably twice a week with a young leaven. A well established leaven may only need refreshing once a week. Refresh or feed your leaven with equal quantities of water and flour. You must throw half of the leaven away before you refresh it; e.g from the original 600 g of leaven, having thrown away half you should have around 300 g remaining. Refresh by adding 300 g of strong wheat flour and 300 g of water and mix well. Cover with a lid and leave to activate. It should become bubbly with lots of active yeast. You can then put your leaven back into the refrigerator for storage. When you want to make bread remove the leaven from the fridge the day before, stir well and allow to come to room temperature which can take 3 to 4 hours and refresh as described above. The following morning refresh your leaven again, throwing away half of it first. If you are making a large batch of bread you need to make enough leaven to have enough for your recipe and enough left over (e.g. 600 g left over to keep the process going). If you need 1000 g of leaven for your bread recipe and have 300 g of leaven refresh with 650 g of flour and 650 g of water. You will use 1000 g and have 600 g remaining. Before using your leaven to make bread it needs to be bubbly and active. 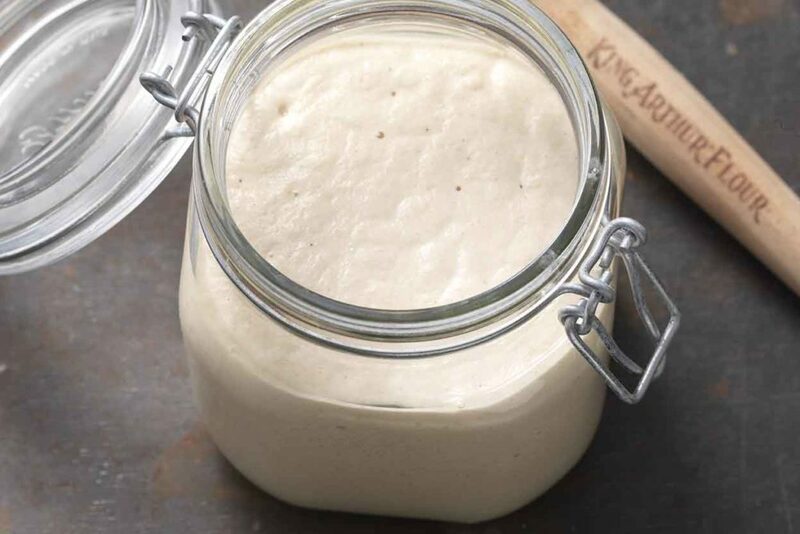 Keep your leaven in a Kilner jar or a plastic container with a lid. Make sure there is space in your container for the leaven to expand! The leaven should smell sweet and yeasty. If it starts to smell unpleasant in any way discard it. You must then start a new leaven from scratch. A good well cared for leaven can live a long time.